We're a smaller family dealership in the Midwest but have a lot to offer. Several customers have already had these experiences and were very satisfied! We'd like the opportunity to do the same for others. Nice.... Glad to see you posting...The ad looks great. We're offering a complete experience with both of these packages - something that you don't get everyday with a new vehicle. If you have any questions about either promotion or would like to discuss building a custom Slingshot don't hesitate to call! The truck's fueled up and ready to go! Fly into either Eau Claire regional or Minneapolis International and we'll come get you! Let's build your Slingshot today! Just a bump on this post to remind people of us and our offers. We've got several Sling's in stock as well as our personal one to get ideas from. If you're local stop in and say hi! We're about to start prepping tires for the ice... Videos and pictures to come. And yes the Monster 62RR will get studded tires this winter. 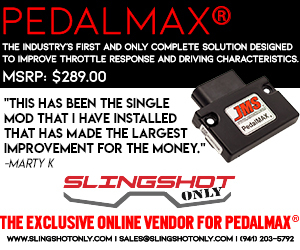 Just announced from the Slingshot group @ Polaris. We stock a lot of clothing and some of the newer accessories so give us a call or e-mail us. Where do we go for this deal? Couldn't find a number on your photo @DKF Texas Thanks for posting! 3 ride events in August comming up.